First Automobile Works is a global contributor in the automotive industry with a 50 year history of innovation. The company FAW was established in 1953 and the name was changed to China FAW Group Corporation in 1992. 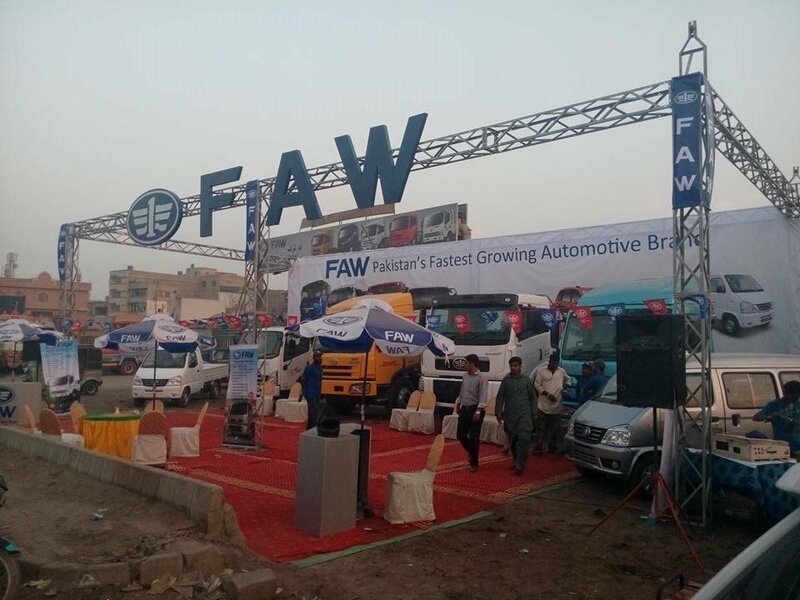 It has been noticed that FAW has recently started doing great in the Pakistani market. Automobile market of Pakistan is very complex and it is not easy for a new investor to compete against the current established players of the market. Along with local production done, the market is also filled with imported cars which further increase the competition. Al-Haj FAW Motors was incorporated in July 2006 and launched first product in October 2006. Started with two variants of heavy duty trucks. They had signed a distribution license agreement with FAW in July 2006, which allowed them to import, distribute and sell FAW products in Pakistan. The joint venture between FAW group, China and Al-Haj group Pakistan, the automaker was able to launch their successful 1.3 L hatchback. FAW V2 is a good car with all the basic and some additional features which surely are lacking in our local cars. It is safe to say that the car is better than Suzuki Cultus, Suzuki Wagon R and even Toyota Passo. Receiving positive response Al-Haj FAW has finally decided to inject 600 million into their plant. The investment is focused for a new paint shop, extended warehouse facilities and modern assembly line. As per plan and government policy company keep on the way of localization of the parts and now they are ahead to bring CKD’s for the other vehicles which are now import CBU condition. In the past, when Chinese automakers came to Pakistan, they unfortunately partnered with weak groups or those who did not have a long term plan. This is what left a bad image on Chinese vehicles. It is not necessarily about the product being inferior in quality; it is just the image that created problems. But after bad experiences, Chinese companies are now smarter in picking partners. 3S dealership is where Al-Haj FAW management thinks that they are different from others and they can overcome that image in the public of being a Chinese firm. There core remains 3S dealership. In the beginning their sales suffered, but by sticking to their policy of 3S network, the results have started to bear fruits. Although this particular automotive group faced a lot of difficulties by the government along with the current position of Pakistani automotive world, still the group has delivered progress and is consistent with it. Many out there think that the group is just producing V2 due to the intense publicity done but the group has heavy and light vehicles both in the menu. The group under light vehicles has FAW Carrier which is 1000cc with a standard grade price of PKR 724,000; the automaker has V2 which is a 1300cc vehicle with a price tag of PKR 1,050,000; then comes FAW XPV which is again a 1000cc vehicle with a price tag of PKR 875,000 and Sirius S80 1.5L and 1.3L with PKR 1,885,000 and PKR 1,705,000 respectively. The automaker has many different offerings in the heavy duty vehicles which include J5M 220 HP 4×2, J5M 280 HP 6×4, J5P 330HP 6×4, J5P 420HP 6×4 and FAW Tiger V. FAW Tiger V was recently launched in Pakistan and success is on its way. The company started its operation here in Pakistan with 7 acres land and now is proud to have an operating land of 27 acres. While talking to the Marketing Manager, Farhan Hafiz, he informed that the automaker is planning to introduce new passenger models in the year 2019. The introduction of newer models can be a turning point in the automobile industry of Pakistan if measures are taken properly and quality is continued to be provided.